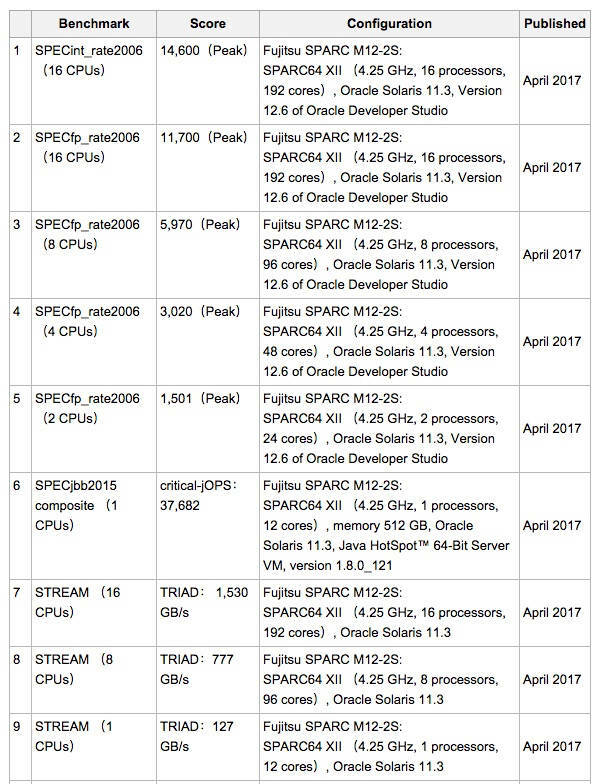 Updated Oracle and Fujitsu have launched Fujitsu’s SPARC M12 server, claiming the world’s fastest per-core performance. It is the follow-on to the existing M10 server line, which topped out with the Fujitsu M10-4S server which scaled up to 64 processors and 64 TB of memory. The largest M12 configuration is 32 processors and 32TB of memory. However Oracle has claimed SPECint and SPECfp benchmark records with the new system. The M12-2 server uses Fujitsu’s SPARC64 XII processor, which has up to 2.5x faster core performance than the prior M10 product. It features a software on chip technology, and increases the number of simultaneous searches to twice that of the M10 when processing with Oracle Database In-Memory. There can be up to 12 cores per CPU, 32MB of level 3 cache, PCIe Gen3 I/O, and DDR4-2400 memory. The CPUs have error detection and recovery mechanisms for error protection across all processor circuits. Oracle says the servers have guaranteed data path integrity, and configurable memory mirroring. As with the M10, the M12 CPU uses Vapor and Liquid Loop Cooling (VLLC) technology, with liquid circulated through the CPU’s interior and being changed to vapour using the processor’s heat to cause the liquid-to-vapour phase change, and thus cooling it. Oracle says it achieves 70 per cent higher cooling performance than the Liquid Loop Cooling technology used in the Fujitsu M10-4 and M10-4S servers, and reduces the Fujitsu SPARC M12-2 and M12-2S servers’ noise by 8dB. Encryption arithmetic - an encryption processing unit performs encryption and decryption processing without external adaptors, supporting RSA, DSA, DES, 3DES, AES, DH, and SHA. There are two models: the dual-CPU M12-2 and the M12-2S, which can scale from 2 to 32 processors, with CPU Core Activation functionality to configure them in a capacity-on-demand style. Customers buy core-based CPU Activation licences (CALS). Such CALs can be moved from one M12 Server system to another and, in the case of a CPU core failure, unlicensed cores will automatically take the place of the failed one. The scale-up M12-2 can have up to 24 cores and 2TB of memory with 64GB DIMMs, 11 PCI Express (PCIe) 3.0 short low-profile slots, and up to 72 PCIe slots with optional PCI expansion units. The M12-2S supports up to 32TB of memory and has a physical partitioning (PPAR) capability, with which the physical hardware can be split into multiple parts, with each part run as an independent system. SPARC M12-2S chassis - effectively dual socket, 2-CPU M12-2 building blocks - can be linked to build scale-out symmetric multi-processing servers, with 16 blocks forming a single system with 3,000+ CPU threads from its 32 CPUs and 384 cores. The linkage uses Fujitsu’s high-speed interconnect technology with high bandwidth and low-latency between the blocks. Each building block includes up to 32 DDR4 memory DIMM slots, eight PCIe 3.0 slots, and eight 2.5-inch drive bays. Up to 58 PCIe slots can be supported with the PCI expansion unit. A base M12-2S building block includes a single CPU, with 12 cores and can be upgraded to a dual CPU block.. 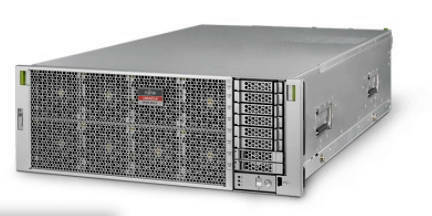 These servers have Oracle VM Server for SPARC and Solaris Zones virtualisation technologies included at no cost. The building blocks, disks, power supply, I/O cards, and fans are all redundant and hot-swappable. When we looked we couldn’t find them; presumably a simple update timing problem. 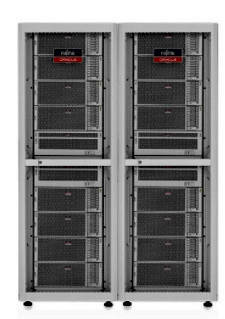 Oracle Solaris 11 and 12 can run on M12-2 and -2S server bare metal or in virtualized configurations. Solaris 8 and 9 environments can run in Solaris Legacy Containers. Customers can migrate from physical servers to Solaris Zones using Oracle P2V tools. Oracle's Solaris Binary Application Guarantee promises that legacy SPARC-based Solaris applications will run unmodified on these M12 Server systems. The M12-2S can run single or multiple Solaris images. Oracle says the Fujitsu SPARC M12 server is a good fit for large-scale online transaction processing (OLTP), business intelligence and data warehousing (BIDW), enterprise resource planning (ERP), and customer relationship management (CRM), cloud computing and big data and analytics. In February Oracle was pretty tight-lipped about its SPARC roadmap, just listing "SPARC next" and "SPARC next+" products, and promising software in silicon. The M12 is clearly the "SPARC next" processor. The roadmap also showed Solaris 11.3 being followed by a "Solaris 11 next" and we think that a Solaris 12 instead of a Solaris 11.x could accompany these M12 servers. The M12 launch suggests that Oracle and Fujitsu are committed to the SPARC architecture and that they are not giving in and rolling over in the face of the Xeon tide. With HPE’s Itanium looking to have, shall we say, a limited future, then SPARC and IBM’s POWER are the only two non-Xeon CPU architectures left in the non-mainframe server market. We're told the results are now on spec.org, for example, here. Go check them out, if you so wish.